If you love your smoothies and still do not want to experience any increase in your weight gain, then i think this article is specially meant for you. When smoothies are prepared the right way, they can give you some important nutrients like protein and fibre. 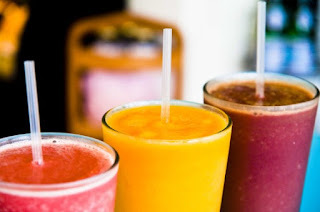 Smoothies also make you full so that you will not fall into temptation of eating too much in your next meal. Moreover, most of the smoothies you buy outside are not always the healthiest choice. It is better you prepare your smoothies back at home that will promote a positive weight loss quest. Size matters, and so do ingredients. Watch out for the "health halo" that seems to surround smoothies, and avoid anything that is described as creamy, decadent or that includes whipped cream or drizzles of anything. Although treating yourself to a smoothie you bought outside is okay once in a while, but you will have more control over the ingredients if you make your smoothie at home. The basic components of a smoothie aren't complicated. You'll need about 1/4 cup of liquid (water, milk, fruit juice, etc. ), a thickener (ice, yogurt, etc.) and fruit or other ingredients of your choice. Adding high-fiber foods to your smoothie can help you feel fuller for longer period. Since they take longer to digest than many other foods, they will leave you feeling satisfied so that you will not likely eat much at your next meal. Include high-fiber foods such as raspberries (8 grams of fiber per cup) or avocado (about 9 grams per avocado). You could also top your smoothie off with some chia seeds, which are packed with 5.5 grams of fiber per tablespoon. Protein also helps make you feel full and may also help you increase muscle mass. Add protein powder to your smoothie if you like, or get additional protein from tasty sources such as Greek yogurt and cottage cheese (use non-fat versions to save calories), almonds, almond butter, pumpkin seeds, oats or kale. And if you're already adding chia seeds or avocado for the fiber, you'll also be getting a healthy dose of protein as well. Fruit has a lot of good-for-you nutrients, but it can also be high in calories and sugar. Sticking to one serving of fruit per smoothie can help balance your calories and sugar with healthy ingredients, and you'll still be able to enjoy a great-tasting creation. Adding sugar or generous dollops of honey or maple syrup loads your smoothie up with unnecessary calories. It is probably already sweet if you have included fruit, but if you need an extra zing, try some cinnamon or get a little adventurous with another herb or spice. Vegetables such as spinach and kale add a lot of nutrients without a lot of calories. And when mixed with the other ingredients in your smoothie, they will not affect the taste as much as you might think. Following this smoothies for weight loss recipes will always put you on track, and you will never be worried about weight gain.